Discover Nocturnal Animals, On A Night Safari Into iSimangaliso Wetland Park, South Africa’s First World Heritage Site. Travel into South Africa's very first world heritage site (iSimangaliso Wetland Park) at night. Hear the African Bush come alive. Educational, Informative and Exciting Night Drive Safari's. A Night Drive Safari is a game drive that operates after dark, with a powerful spotlight. This 3 hour safari on a Open Game Drive Safari Vehicle offers one a chance of witnessing the elusive Leopard, Giraffe, Buffalo, Elephants, Hippo’s grazing, Chameleons and so much more. The advantage of a night drive is that they provide access to nocturnal species that are rarely seen during the day, such as Hippo, Bush Babies, Chameleon’s, Aardvarks and Leopard are also more active after dark, and there is a greater probability of seeing them hunt at night. Night Drive Safaris are ever so popular with the safari-goers to take part in. A night drive safari has a unique and exciting atmosphere; different types of animals (nocturnal) are active at night, from the big cats to smaller mammals. 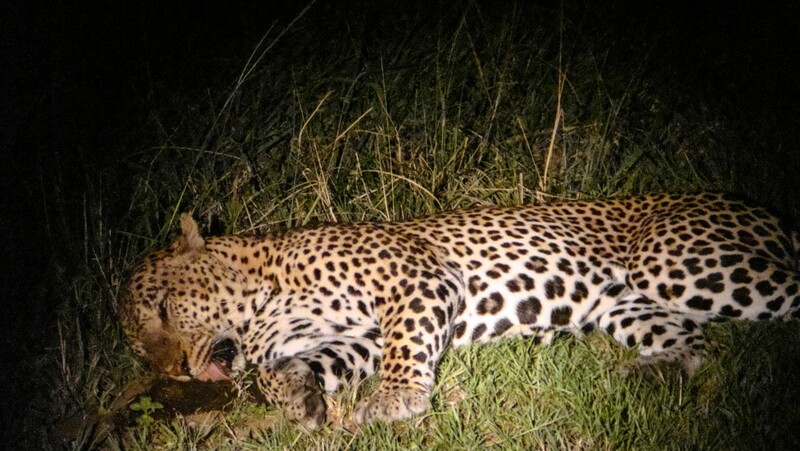 With varying behavior nocturnal animals are bolder at night and shy during the day this increases your chances of witnessing that elusive Leopard. Exhilarating to sit in the middle of a herd of elephants in the moonlight or the thunder pounding sound of buffalo hooves in the darkness is also quite a rush. Join Heritage Tours & Safaris on a Night Drive Safari departing daily. We travel in a exclusive concession-ed area, your knowledgeable guide explains animal movements by night, star constellations and of course enjoy magnificent sightings while on this safari. Departures are 7:00 or 8:00 pm daily and truly a must should you be in the area. Its bush calls, predators hunting and animals stalking. Each game drive vehicle is fitted with 2/3 night spot lights, you are welcome to give a hand to the ranger and take part in discovering the African bush by night. St Lucia is home to one of the largest Free Roaming Hippo Populations in South Africa. Combined with other wildlife, Night Drive Safaris are incredibly popular within the iSimangaliso Wetland Park. Departing daily (Weather Dependent), your tour operator will fetch you from your accommodation in St Lucia. It is advisable to take a jacket along as the evenings may become a bit cooler. Please note that the outings do not include any meals or refreshments. Your safety is paramount to us. We take special care in ensuring that you and your fellow travelers are at all times safe. All vehicles are fitted with satellite tracking, first aid kits and all rangers will at all times that you are not exposed to unsafe conditions. One of two types of Toyota Vehicles area used either Land Cruisers or Hilux vehicles. These vehicles are incredibly reliable and have proven themselves as the best vehicles to utilize in these conditions. All vehicles are 4x4 as well. Stringent maintenance plans are in place once again ensuring optimum performance at all times. All night drive vehicles are fitted with night drive lights further increasing your chances for some magnificent sightings. Hard tops, roll down sides should the weather turn, seat belts for all clients and additional blankets for your convenience. A safari and a Ranger is truly what makes for an exceptional time out on Safari. Our Rangers are not only knowledgeable but also passionate. Their ability to track is quite wonderful not to mention the ability to find Chameleons from meters away during the dark of the night. Heritage Tours & Safaris has dedicated specialist night drive rangers to your outing, their information and bush sense is incredible. It's dark, the bush is alive and their are a lot of noises. This nocturnal affair of wildlife at night can only be described as magical. Did you know that certain wildlife are only active during the night Hippo, Leopard and Bush Babies to mention but just a few of them. Hunting in the cover of the dark, grazing by moonlight or trapping insects their is just so much going on when the sun sets. iSimangaliso Wetland Park offers us a pure safari with an abundance of wildlife and fauna and flora. This is the choice of operator for all your activities in St.Lucia. You definitely get your money's worth with this professional company. We used Heritage for the Day Safari to Umfolozi, the Night Safari and boat cruise on the estuary. All our guides we excellent - knowledgeable, friendly and professional. Heritage tours really made our time great. Our 2 night package was full of activities that were very professionally run. We thoroughly enjoyed our time and our guides were particularly knowledgeable. I would recommend this company for fantastic value.